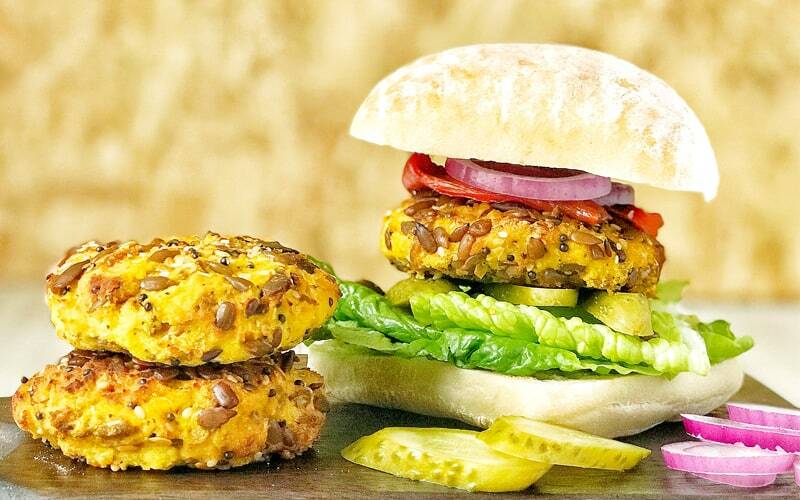 These tasty butternut squash and butter bean burgers are a great meat-free alternative, are packed full of flavour and are the perfect way to warm up on a chilly evening. This recipe is suitable for both vegans and coeliacs and uses simple, wholesome ingredients without compromising on great taste. Delicious on it’s own or served with salt and pepper sweet potato wedges and salad. Slice the butternut squash in half and scrape out the seeds. Place them on a baking sheet, drizzle with a small amount of rapeseed oil, put 1 unpeeled garlic clove in the centre of each half (2 cloves of garlic in total) and roast in the oven until completely cooked, approximately 30 minutes. Set aside to cool. When they are cold enough to handle, peel and weigh out 200g of roasted butternut squash. Any leftovers make a great addition to salads or a healthy snack. Put the 200g of butternut squash, butter beans, a tablespoon of rapeseed oil, thyme leaves, 1/2 teaspoon of sea salt and a good grinding of freshly cracked black pepper in a blender. Squeeze the garlic out of the skins and add this to the mix too. Blend until mostly smooth. Stir in the ﬂour and Omega Sprinkles. Turn the oven up to 200 degrees C. Take a large tablespoon of the mixture and squash it into the shape of a burger. Sprinkle some extra Omega Sprinkles on each side of the burger and press down so the seeds stick to the outside. Put the burgers on a baking tray, drizzle with rapeseed oil and bake for 30 minutes. Serve with condiments and veggies of your choice. We used red onion, chargrilled red pepper, lettuce and gherkins. Recipe and photography credit to the The Wholefood Warrior.